Mr. Hollas is a pioneer in the field of crowdfunding with multiple patents granted for web-based capital marketplace systems. He is the founder and chief inventor of EquityNet and continues to lead the Company's efforts to create and introduce innovative new products and services. He is responsible for the overall management of the Company, including its strategic direction and fiscal and professional integrity. Prior to founding EquityNet in 2005, Mr. Hollas served as Division Manager for Beta-Rubicon, Inc., a consulting firm specializing in technology assessment and business due diligence services. He conducted extensive research on methods of conventional due diligence, causes of private enterprise failure and methods for risk prediction, marketplace characteristics in the private equity industry, and it was during this time that he developed the business model for EquityNet. Mr. Hollas has 20 years of experience as an independent technology analyst and investment manager in the private and public domains. He has personally invested in over 30 emerging technology companies in a wide range of industry sectors, including various software sectors, semiconductors, biometrics, networking, wireless communications, and conventional and alternative energy. Mr. Hollas developed and applied proprietary quantitative models, statistical methods, and research approaches that were critical to his investment management performance. He worked previously on process modeling and supply chain automation of complex systems as a process chemical engineer for Phillips Petroleum. 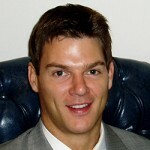 Mr. Hollas earned his B.S in Chemical Engineering (with Honors) from the University of Tulsa, Oklahoma. The crowdfunding industry is growing at an incredible rate, allowing startups and small businesses to launch more crowdfunding campaigns than ever before. Entrepreneurs from all types of industries have leveraged the opportunities that crowdfunding offers to raise much needed capital for their companies. As such, some VCs have begun to embrace crowdfunding as a new source of deal flow that allows them to vet deals much quicker than in days past. 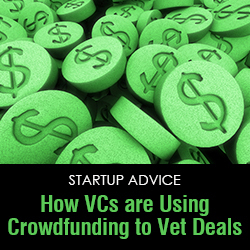 Deal flow for VCs customarily originates from referral networks or website submissions. These deals are often structured in assorted formats and sometimes lack necessary data which can muddle up the due diligence process. Crowdfunding platforms not only provide VCs with efficient instruments to review deals and maintain communication with entrepreneurs, it also provides them with additional deal flow. It gives them the ability to look at more deals in more geographically disparate locations and invest. VCs can review business plans, proforma financials, disclosures and other documentation without having to listen to a glossy sales pitch. They are then able to ask crucial questions of the entrepreneur seeking funding. Crowdfunding platforms naturally use technology to catalogue multiple properties of companies looking for capital and present them in a uniform format that can be rapidly assessed by any prospective investor. VCs and other investors benefit because crowdfunding creates a much faster due diligence process than conventional means, and many VCs have stated that it helps them categorize deals and focus on those that are worth their time. Crowdfunding also helps the class of VCs and other investors that don’t have staff dedicated to sourcing projects, and when entrepreneurs approach this class of investor, they are more likely to get a more personal and direct response, rather than be vetted by staff that are not likely to be as knowledgeable as the investors who make the final decisions. Entrepreneurs who start crowdfunding campaigns are presented with sets of tools that help them package and present information required by VCs and other investors. VCs can then spend less time and energy on reviewing these deals since all of the information they need is presented right in front of them. This hurries the rate at which companies are able to receive funding and helps to simplify the investing process for VCs. It also requires entrepreneurs to prove the strength of their team and the significance of their products or services within the actual marketplace. Those who can prove the strength and value of these aspects of their companies are exposed to a wide range of VC firms and other investors who want to invest in their businesses. There are currently tens of thousands of investors that are using crowdfunding, which also proves to be useful to VCs in that it creates an environment that allows them to take advantage of the “wisdom of the crowd,” which is a well-documented phenomenon where a group’s collective insight is often more reliable than that of the individuals that make up the group. Crowdfunding platforms are designed to aid investors by allowing them to communicate and assist one another with due diligence and other inquiries specific to various deals. In this same vein, crowdfunding is also effective in delivering validation of companies’ products and services by monitoring early adopter consumers’ reactions to them. Products like Oculus Rift, Pebble, and the Scanadu Scout, which all received far more funding than what they set out to achieve, are prime examples of that. Crowdfunding, while still a relatively young industry, is proving itself as a valued partner to the VC community. As it continues to grow, we will likely see much more interaction between the two industries.